WITH the support of Fine Gael, Labour and so-called ‘Independents’, the Fianna Fáil/Green/PD Government has again renewed draconian measures contained in sections of the Offences Against the State Acts. Only Sinn Féin’s four TDs opposed the Government motion and proposed a Bill for the repeal of the Acts. “The element proposed for renewal today comes up every year. I am of the view very strongly that it is neither appropriate nor justified to continue to renew emergency legislation in a very changed situation on the island of Ireland, and a very welcome change it is. “Once again I am imploring all deputies to consider the highly corrosive effect of this legislation on human rights, civil liberties and democratic life in this state before voting today. “No emergency exists that could possibly justify the continuation of the draconian measures contained in the sections that are up for renewal or indeed the rest of the Offences Against the State Acts. “Once again, this year the Justice Minister’s report on the operation of the 1998 provisions is lacking in the detail required to make an informed judgment of the operation of, the use or abuse of the 17 sections. Simply listing the number of occasions on which the various provisions have been used does not allow for informed democratic scrutiny of their operation. “The non-emergency operation of this legislation is in violation of Ireland’s requirements under the derogation regimes of the International Covenant on Civil and Political Rights and the European Convention on Human Rights. The Good Friday Agreement requires steps towards security normalisation including the progressive elimination of the Acts’ provisions as circumstances permit. Earlier there had been uproar in the Dáil when Justice Minister Dermot Ahern failed to appear to move the Government motion, sending Junior Minister Barry Andrews instead. It was revealed that a Dáil committee dealing with separate legislation had been adjourned that morning on the basis that the Minister could not attend because he was moving the OASA motion in the Dáil. Ahern’s real intention was revealed when Tánaiste Mary Coughlan admitted he was holding a press conference. 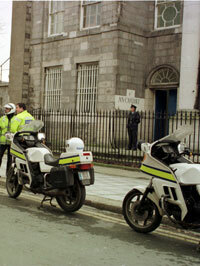 This led to protests from Fine Gael and Labour and the Dáil was suspended several times. But despite their protests, both Fine Gael and Labour accepted the Government motion. “The state of emergency is over... We should drop the use of the Offences Against the State Act.” He said his party “does not want to see the use of the Special Criminal Court continue”. In every subsequent year, Finian McGrath and Green Party deputies opposed the renewal of the relevant sections of the Offences Against the State Act.